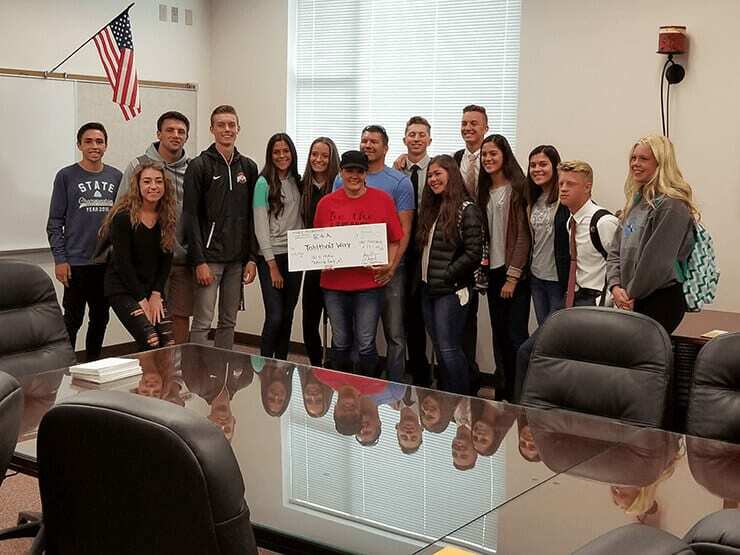 As part of the Especially for Athletes program, a group of athletes at Maple Mountain High School recently presented Tabitha’s Way a check for more than $1,000. Especially for Athletes encourages athletes to give back and to set an example for others. Maple Mountain’s group has been an early participant in this program and these athletes are definitely leading by example. The group’s members decided they would like to give back to the community by raising funds for Tabitha’s Way. Tabitha’s Way is a local food pantry that serves those in need in two locations: one in American Fork and the other in Spanish Fork. For every $4 received, Tabitha’s can feed a person for a month, so the generosity of the students at Maple Mountain will result in feeding 250 people. The E4A group at Maple Mountain also recently helped out with the Special Olympics track meet held at MMHS. We at Tabitha’s Way think it is important to show the great work and hearts the young adults in our community have. Thank you Especially for Athletes and thank you the athletes and students at Maple Mountain High School. This entry was posted in Press and tagged Maple Mountain High School, Tabitha's Way.